A couple of days ago, drone enthusiast David Eighteen took his Yuneec Typhoon H to the waterfront of the River Medway and sort of stumbled upon this almost 100-year-old U-boat while flying his drone. David’s hi-res aerial photos and some additional research into this shipwreck make for a very interesting story and it is a great example of how drones can open up a new world that otherwise may go unnoticed. 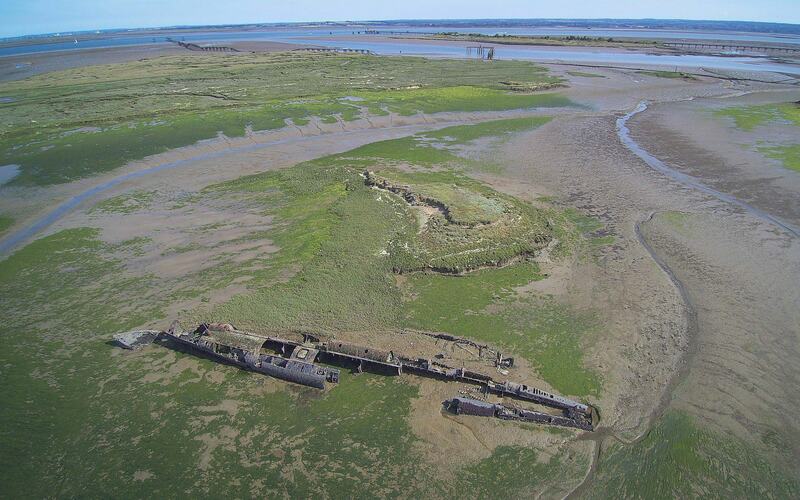 The almost 100-year-old German U-boat from the First World War was first spotted around 2013 after a big storm had reshaped the mudflats of the River Medway near Humble Bee Creek at Stoke Saltings in England. After the First World War, many German U-boats were brought up the Thames Estuary to be dismantled and re-purposed. The diesel engines that powered the submarine, for instance, are believed to have ended up at a cement factory. The hulls were typically scrapped.